I really like the idea that a horse could earn its keep through painting. My guess is that Zelda would pick up painting pretty quickly. If she didn’t eat the brush. According to his website, Metro Meteor earned nearly $300,000 on the track before his knees did him in. Once one of the fastest Turf Sprinters at Belmont and Saratoga, crippling knee injuries end ended Metro Meteor’s racing career. With no chance at a second career as a pleasure horse, Metro was adopted of the track by Ron & Wendy Krajewski. Ron noticing that Metro liked to bob is head to get attention, thought Metro might enjoy painting. 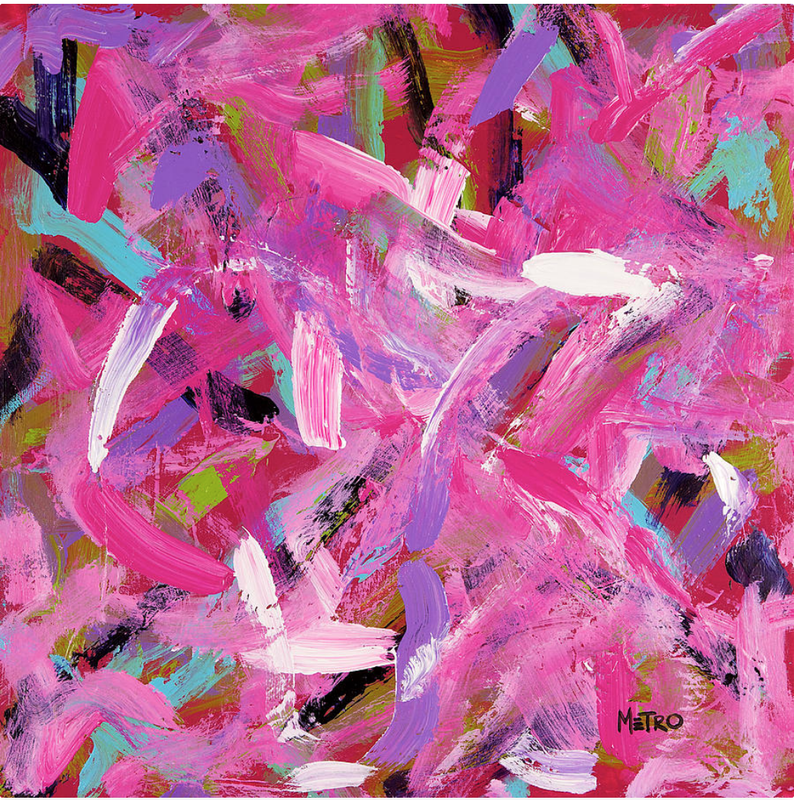 With brush in teeth, Metro now paints bold colorful abstracts. The sales of Metro’s paintings help other horse in need. 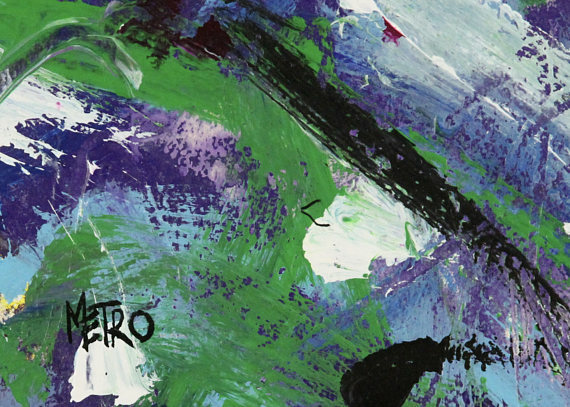 Metro painting one of his abstract works. I have to say, that gelding has a real talent for color. 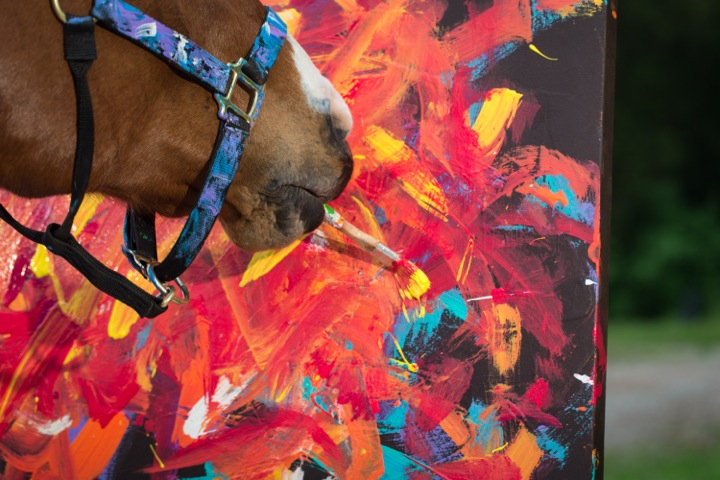 Proceeds from Metro’s paintings pay for his treatment and to support the New Vocations Racehorse Adoption Program — to the tun of nearly $45,000! Metro’s paintings are currently sold out on his website but you can buy a few in this Etsy store. Prints of Metro’s paintings are also available on FineArtAmerica.com. Here’s one of the “mini” paintings on Etsy. This is one of the prints available through Fine Art America.